Formed by Mark Wilkinson in 1985 Red Moon Joe are not the most prolific recording country rock band around, more’s the shame, with this being only their second album since 1990s critically acclaimed debut ‘Arms of Sorrow.’ They split up in 1993 and Mark spent fifteen years touring Europe and the U.S. playing guitar with artists of the calibre of Steve Earle, Townes Van Zant, Guy Clark, Emmylou Harris and Jay Farrar. These are all artists who could get pretty much anyone they like to play with them, so he is fairly obviously no slouch musically, and it really shows on this excellent album! The band consists of all of the original members, Mark Wilkinson on lead vocals, guitar and bass, Paul Casey, drums, vocals and percussion, David A. Smith on bass, guitar and vocals, David Fitzpatrick plays guitar, mandolin, banjo, harmonica and vocals, with the addition of a new boy, Steve Conway who plays pedal steel, dobro, guitar, mandolin and vocals. A tremendously talented group of musicians and it shows with the variety of sounds and the incredible dexterity and huge amount of skill with which they play. Seven of the songs were written by Mark Wilkinson plus a co write with Steve Conway and three by Conway and David A. Smith. The album contains mainly country rock, nothing hugely original you might say, but building a new generic offshoot was probably not the aim! If their aim was to make an album of superbly crafted, often acoustic country rock, with excellent songs, great playing and singing, that aim was achieved with interest! The album does however have a nice feeling of individuality with the instrumentation never over done, the beautifully put together songs and the perfect for country rock vocals. They can probably be fitted into a similar mould to Chris Hillman/Desert Rose band brand of melodic country rock with their catchy melodies and excellent harmonies, hardly an insulting comparison, but justified! inclusion of mandolin as well as acoustic guitar on a mid tempo country rocker about setting down roots.Girl I Used To Know is a really good jangling mid tempo song with melodic electric guitars and steel plus excellent harmonies on an evocative heart string tugging ‘leaving song. Listen To Her Songs is led by the lovely bell like chiming mandolin on an atmospheric country ballad and the final song on the album Guy Clark is not only an excellent tribute to the great Texan singer songwriter, but also contains humourous elements despite thematically bemoaning missed opportunities, as well as being an excellent summing up of Mark Wilkinsons career to date! 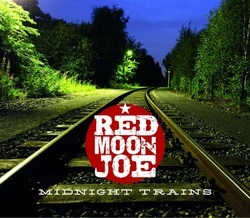 This is a quite uplifting and upbeat album that confirms Red Moon Joe are more than welcome back and proof of what we have all been deprived of for the last two decades. As I said earlier this doesn’t bring anything hugely original to the world of country rock, (nothing really can!) but it is a very, very good addition to it, containing as it does a diverse range of tempos, atmospheres, high quality singing, songwriting and playing. Superstars careers have been built on much less!